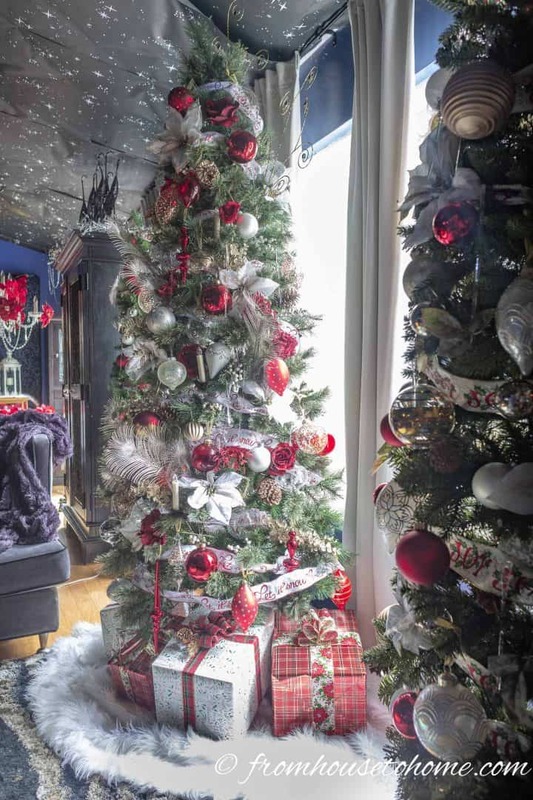 These white, red and gold Christmas home decor ideas are easy and inexpensive ways to add holiday spirit to your house. 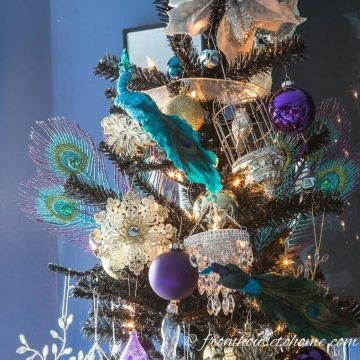 Every year, I like to choose a different color theme for my Christmas decorations, like the blue and white Christmas decor I had last year and the Kate Spade inspired tree from the year before. 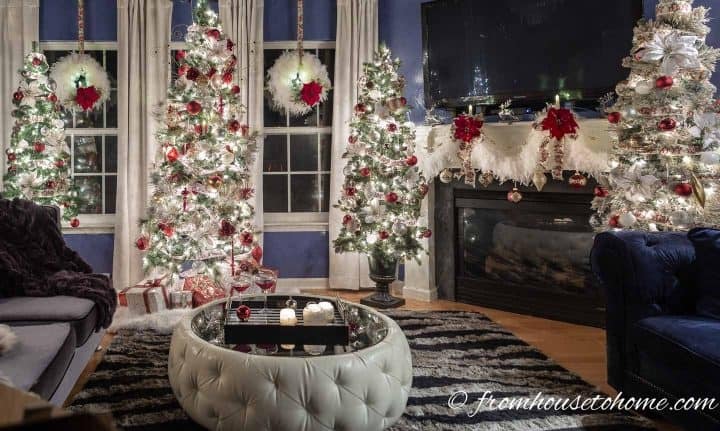 This year I decided to go in a more traditional direction…and these white, red and gold Christmas home decor ideas are what I came up with. After a few DIY projects and lots of Christmas tree decorating, I’m happy to say that my Christmas decorations are finally up! In the main living area, I decided to go with white, red and gold Christmas decorations. It’s a traditional color scheme, that in all my years of decorating, I’ve never done before! 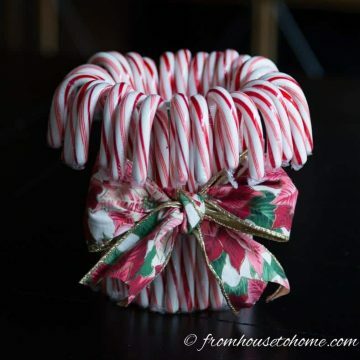 Well except for this red and white DIY candy cane centerpiece I made a couple of years ago. 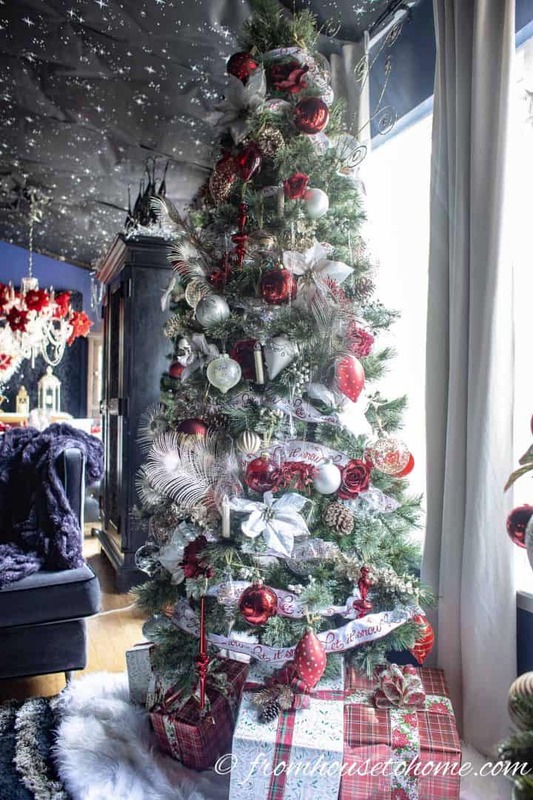 But I’ve never used red as the main color for my Christmas decor. 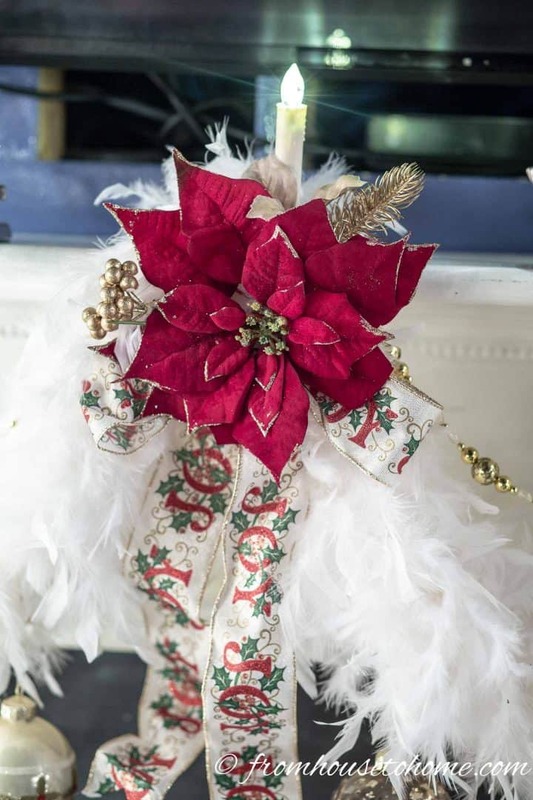 Since I’m going with a traditional theme and I usually try to incorporate some flowers in my Christmas decor, I decided to use poinsettias as a common element to tie the room decor together. 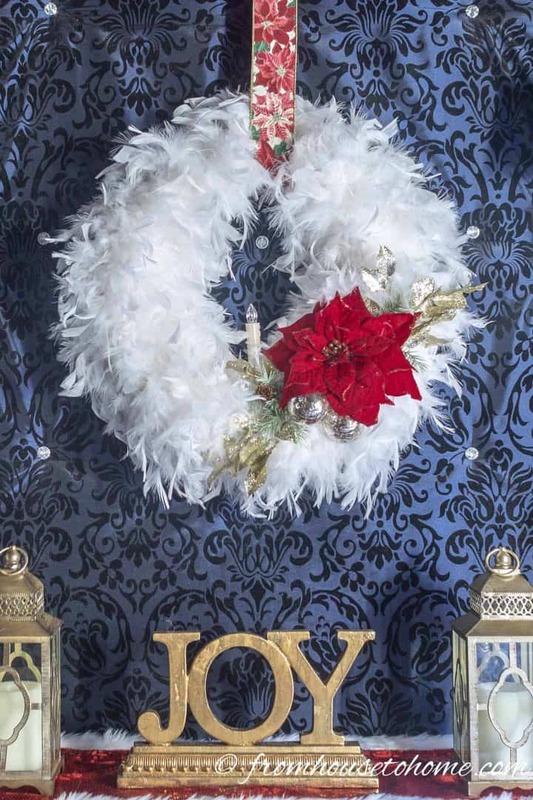 If you’ve seen any of my previous year’s Christmas home decor, you won’t be surprised to hear that feather boas will also be making an appearance. 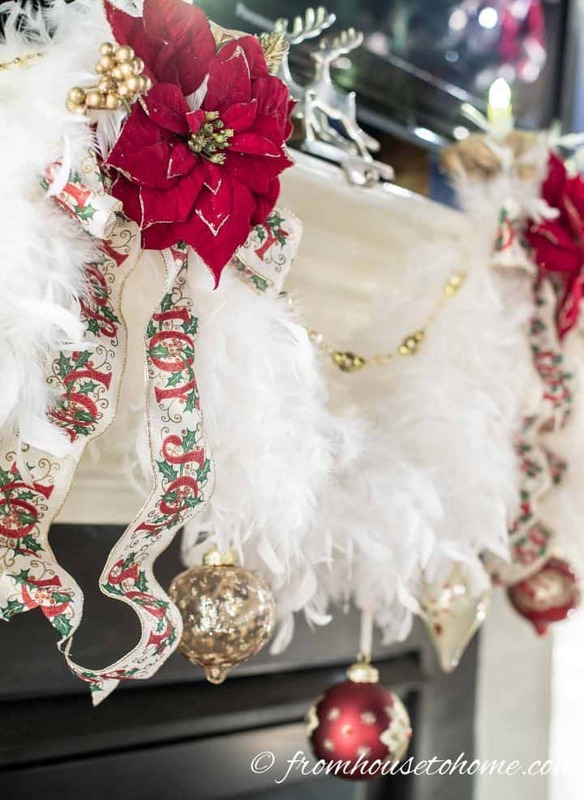 They’re one of my favorite things to use for inexpensive Christmas decorations. And of course, lots of lights. 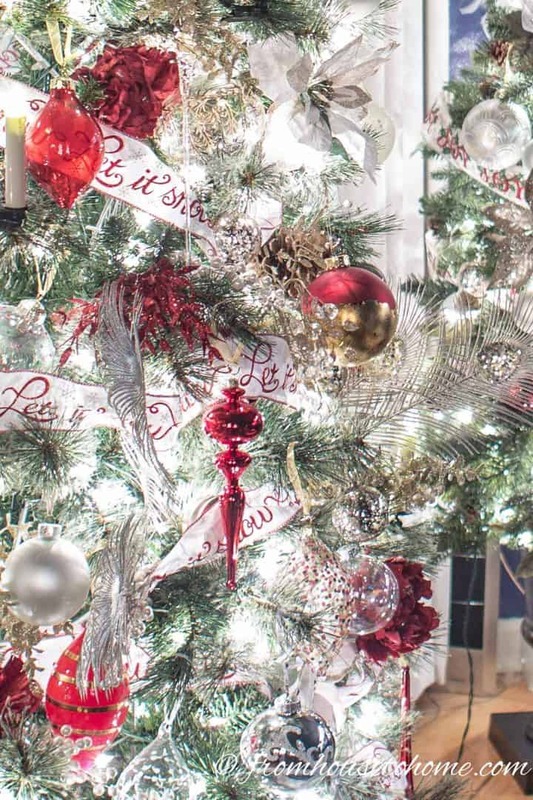 Keep reading to see my white, red and gold Christmas home decor ideas. 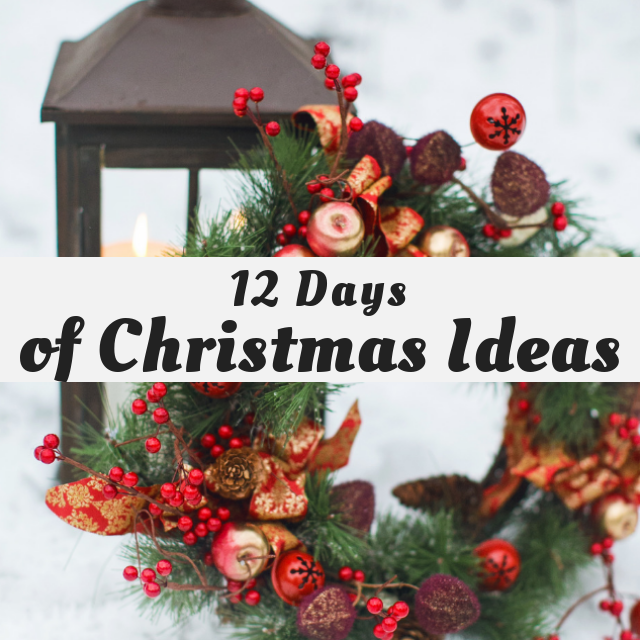 But don’t forget that this is part of the 12 days of Christmas series. 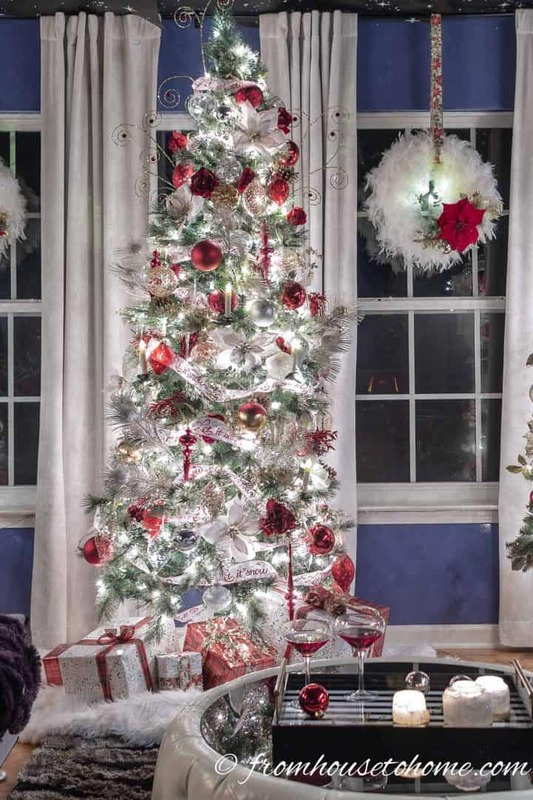 Of course, I couldn’t decorate for Christmas without doing a white, red and gold Christmas tree. But instead of doing just one tree, I decided to do 4! One big tree in the middle of the windows. And 3 smaller trees in urns. Two on either side of the fireplace. And one at the other end of the windows in the living room. It was a little shorter than I wanted it to be, so I made a stand for it by wrapping a box in coordinating wrapping paper. Besides the usual store bought ornaments, I also made some gold-leaf and red ornaments (using the same process as my DIY copper leaf ornaments). 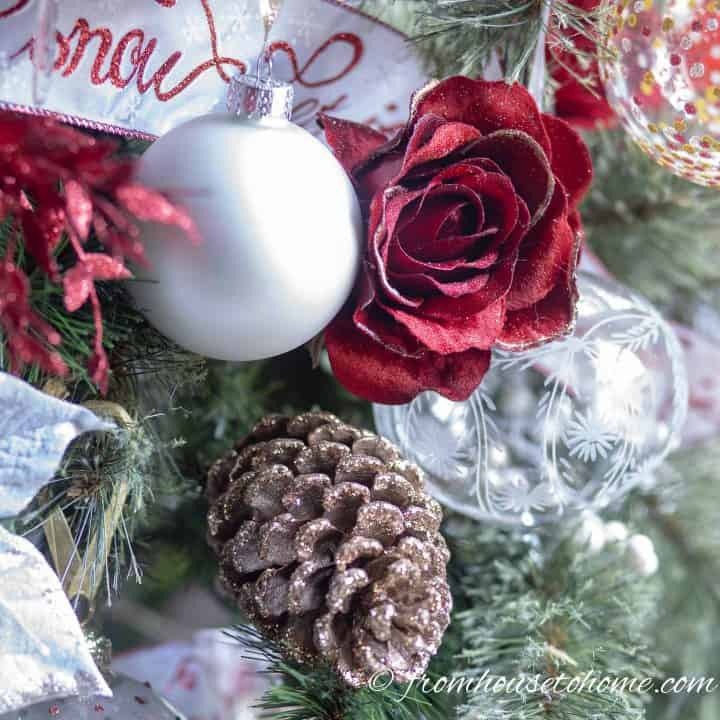 Ribbon, gold sparkle pine cones and faux roses add some extra texture to the tree. The red even makes a statement when the lights aren’t turned on. 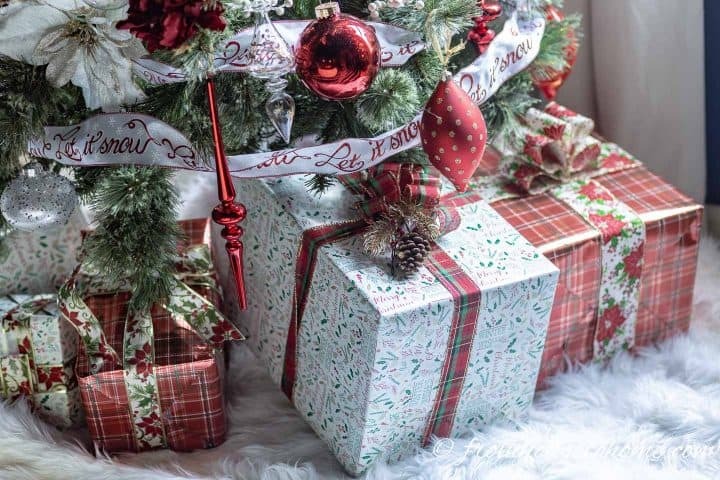 Wrapping presents in paper that coordinates with your color scheme is another easy way to add to your Christmas home decor. I used reversible wrapping paper that I bought from Costco…that makes it easy since they’ve already chosen the patterns 🙂 Then I used matching ribbon to tie them up. 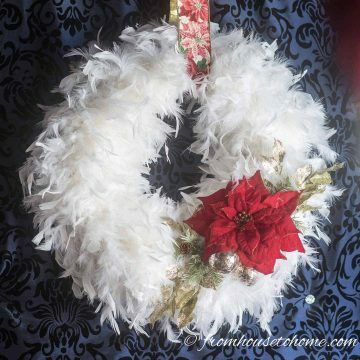 A couple of weeks ago, I made some DIY white, red and gold wreaths from feather boas. These were hung in the windows between the Christmas trees in my living room. And also above the buffet in the living room. I did make one addition to the wreaths after I hung them up. I added a battery operated candle* to the center of each wreath. The light makes the wreaths show up better at night. 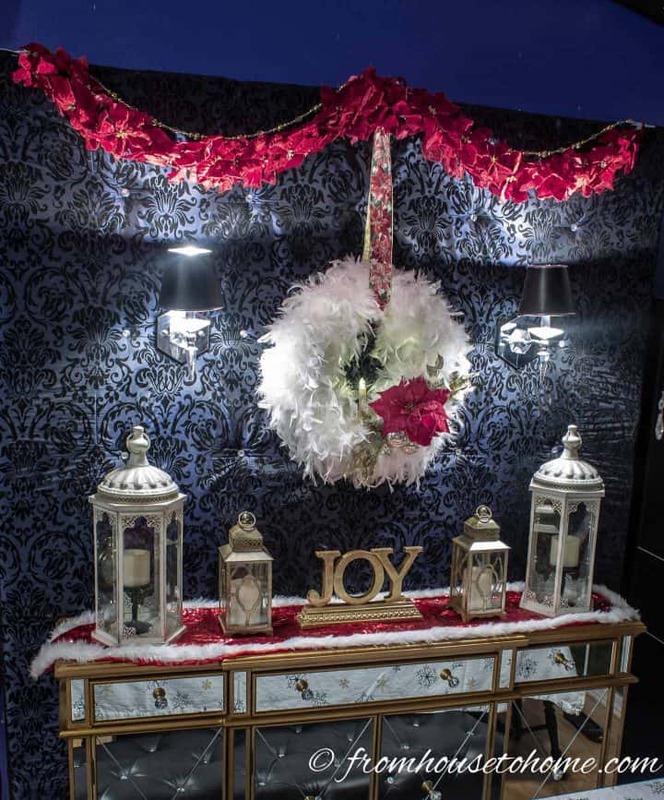 Draping a red poinsettia garland over the top of the buffet carries the color toward the ceiling. This helps to define the focal point at this end of the room. 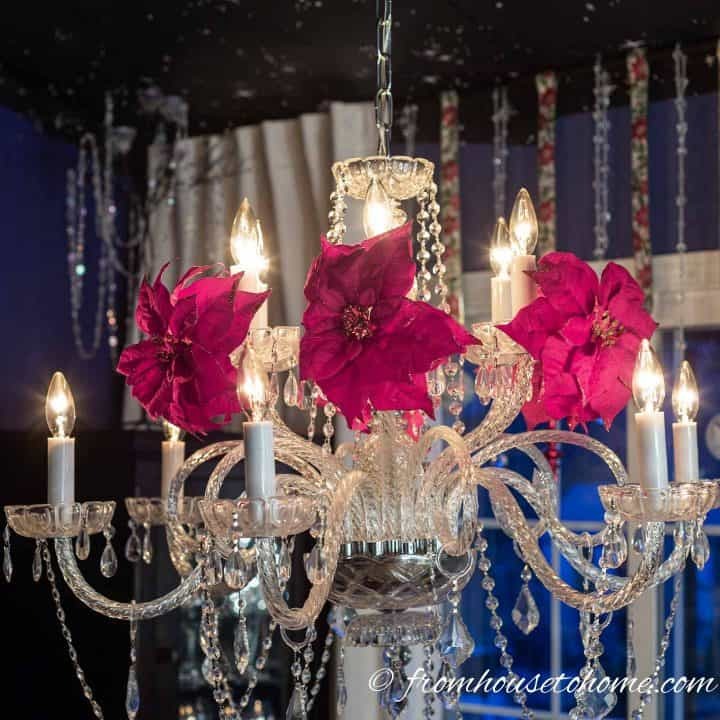 Since it doesn’t make as much of a statement as the poinsettias, adding some lights above it helps draw your attention to it. 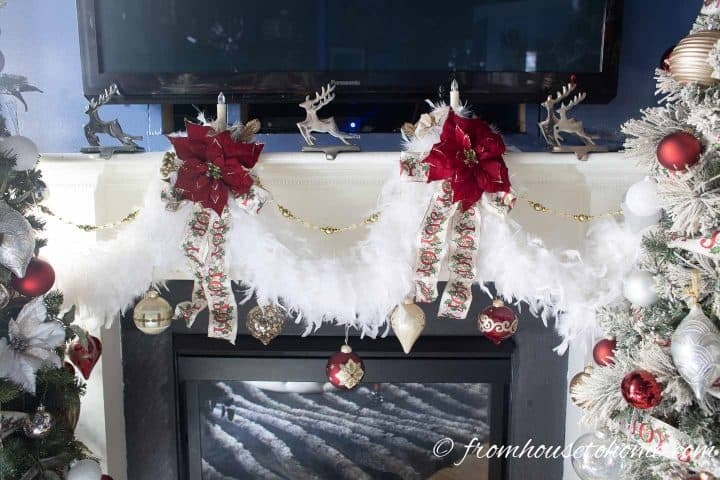 For an easy way to add some Christmas color, I like to hang ornaments on different lengths of ribbon. 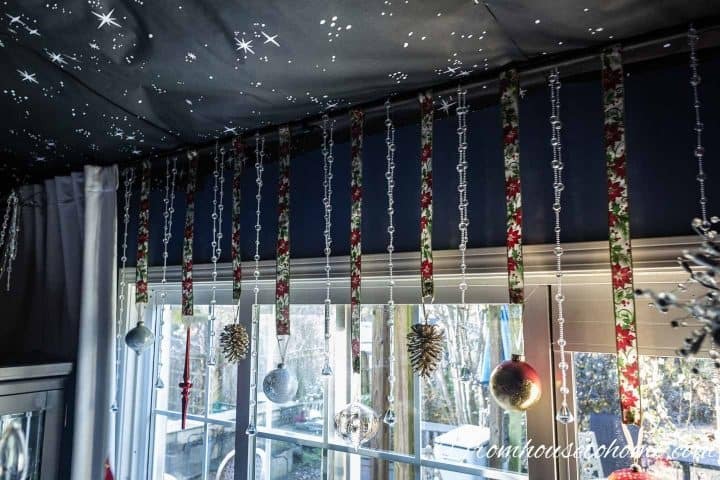 In my dining area, I used white, red and gold ribbon with a poinsettia pattern to hang ornaments from the curtain rod over the sliding doors. As you may have seen, I did the same thing with the DIY pine cone ornaments I hung from the mantel in my bedroom. 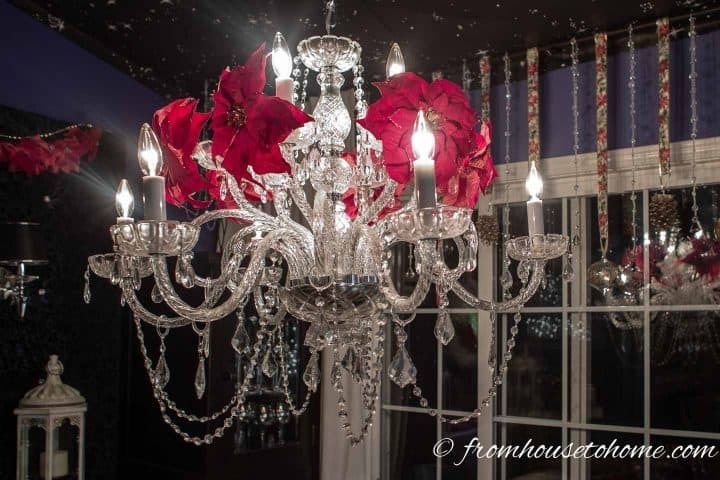 Another one of my favorite ways to decorate for Christmas is to add ornaments to my chandelier. Normally I hang them from the chandelier arms. But this year, I decided to use clip-on poinsettia ornaments to dress it up. 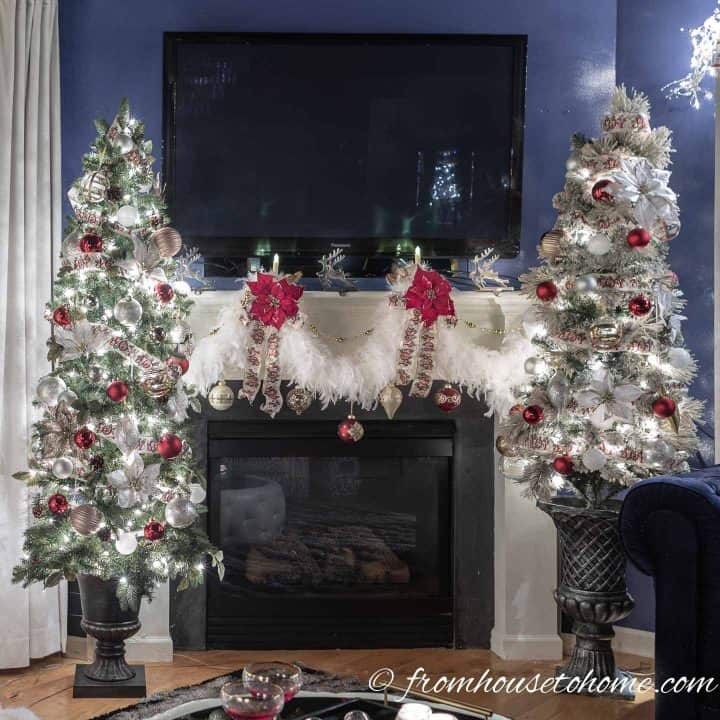 Since I put trees on either side of the fireplace, I wanted to use some mantel decor that tied in with the rest of the decorations but didn’t detract from the trees. As you’ve probably seen, I also have a TV over the fireplace, so there isn’t much space to put a big display. 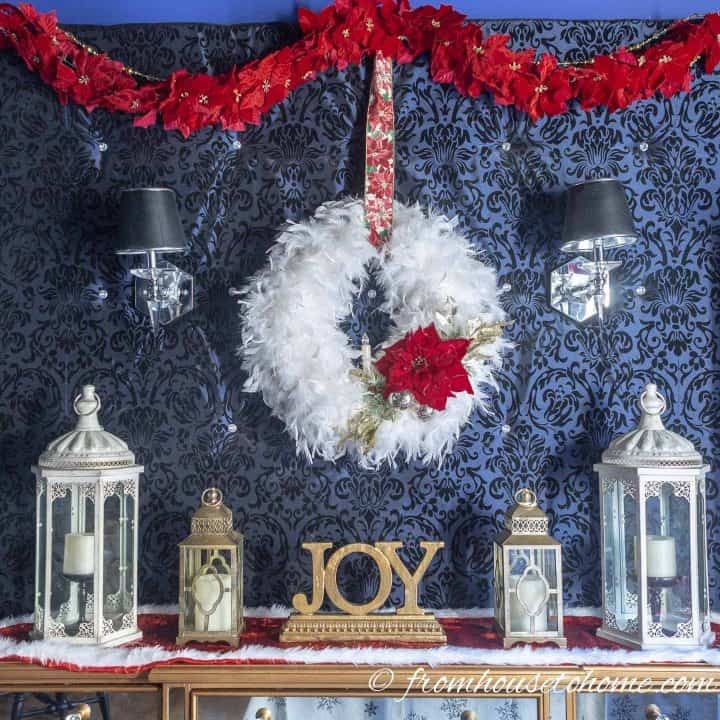 So I ended up draping feather boas in front of the fireplace, and adding more clip-on poinsettias with ribbon and a battery-operated candle to the top. Then I hung a few white, red and gold ornaments from the boa. Now the mantel echoes the wreaths on the window. Just like with any kind of decorating, repetition really helps to create a cohesive design. 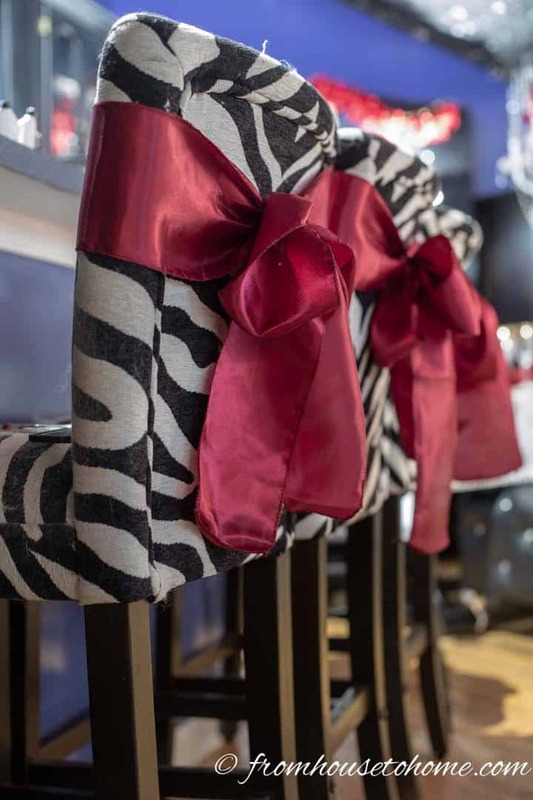 To dress up my bar stools, I tied some red chair sashes around them. 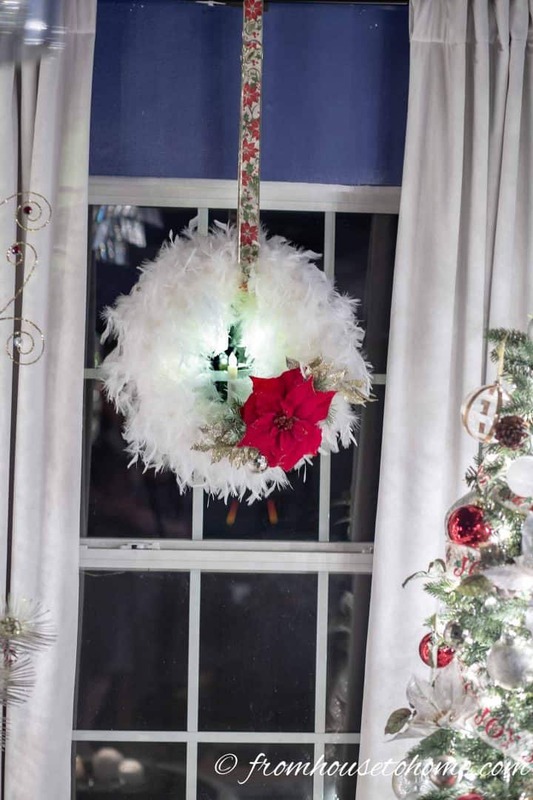 It’s a really easy and inexpensive way to add to your Christmas decor. I also like to use red runners on my console tables and anywhere else that needs a little color. Well, that’s it for my white, red and gold Christmas home decor ideas. 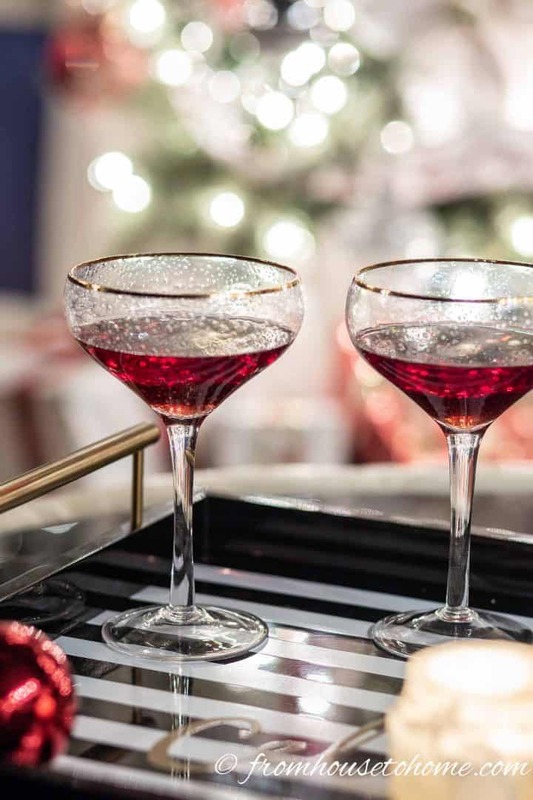 Time to kick back with a drink (even if it is just cranberry juice) and check out all of the other fabulous Christmas decor ideas from my blogging friends. 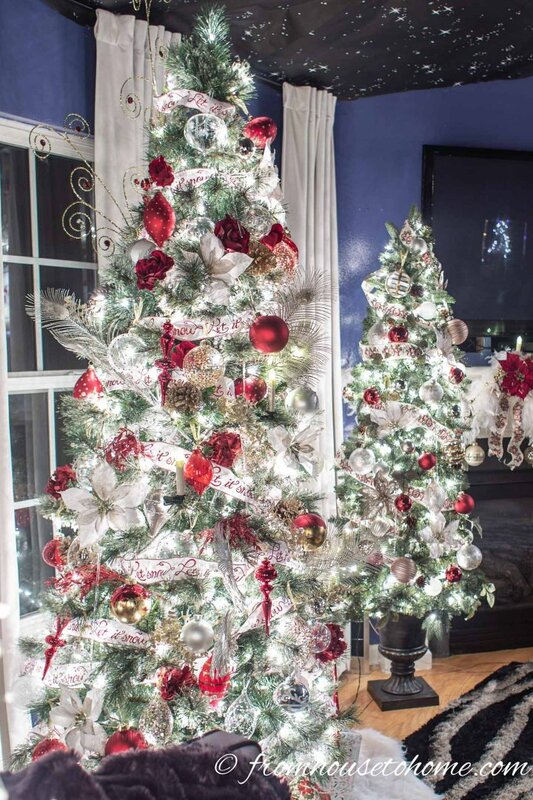 Have comments or questions on our white, red and gold Christmas home decor ideas? Tell us in the section below. WOW… I love how you’ve decorated your house. 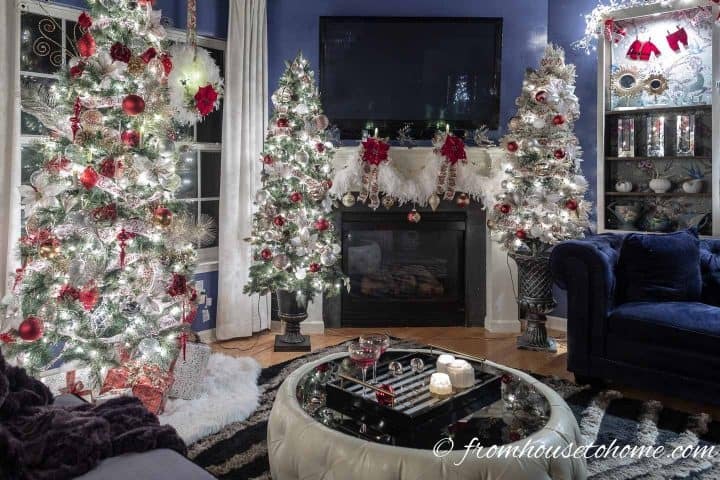 I love the idea of having so many trees in the living room. 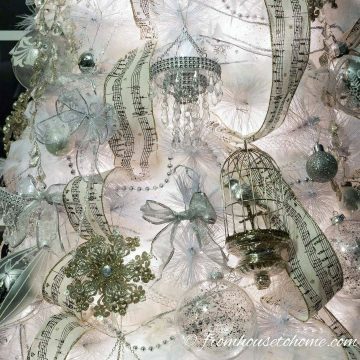 And I’m sitting here looking out the large window in my office and I think I’m going to borrow your idea of hanging the ornaments on ribbon. I’ve done something similiar before with invisible thread but I like the look of the ribbons. Oh my goodness, your trees are absolutely beautiful! It all looks so magical with the lights – I am sure it’s even better in person! Wow! 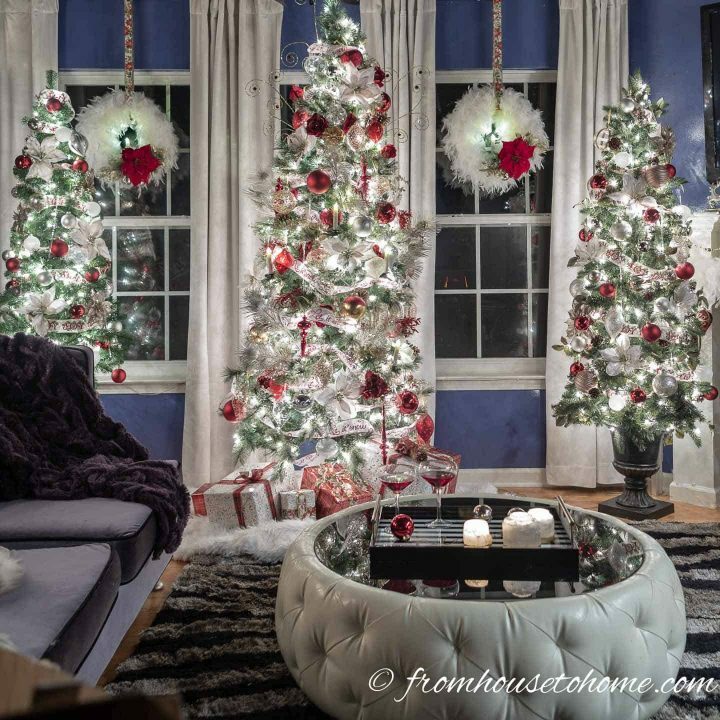 I love all of your trees in the living room! They are beautiful! Your home is gorgeous! 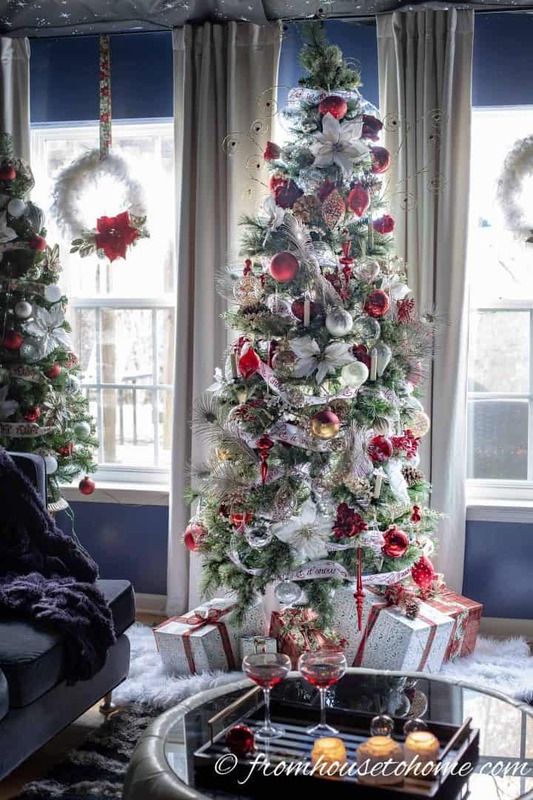 Red & white is one of my favorite Christmas themes. 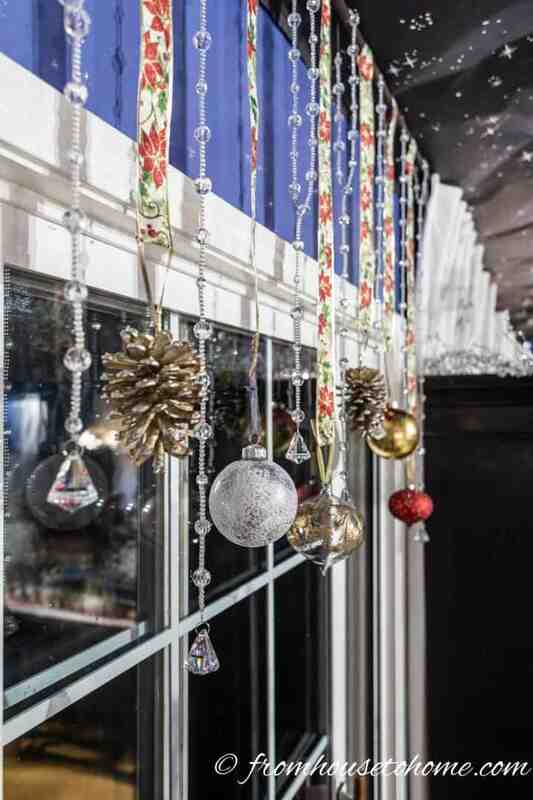 I like to hang ornaments at varying heights in our living room window too. 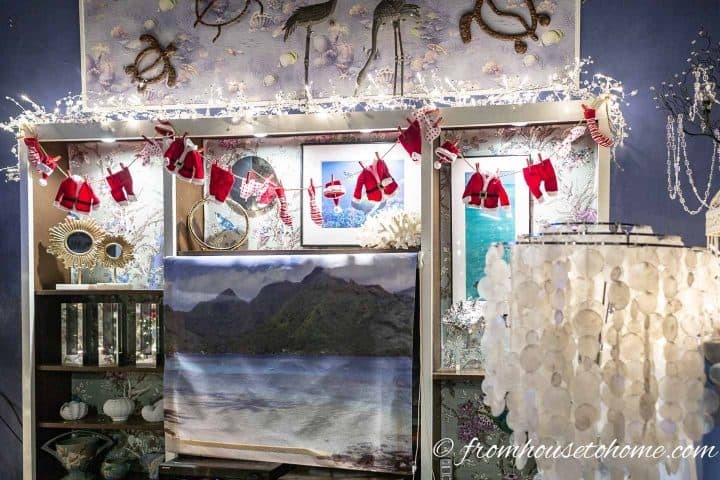 Your home looks very festive and ready for the holidays!